How to Pre Order Cheapest BSNL T-Pad Tablet? Indian Telecom Company BSNL has recently announced the cheapest android tablets that partnership with an electronic company Pantel. The Tablet Pc’s are now evolving in the electronic market and getting attractions more than computers. Initially they launched three models of tablets and each has different variety of features. You can choose any models, but cheapest one is T-Pad IS701R (Rs.3250). This will be alternative to Aakash, the cheapest tablet released by Indian Government and it has more features than Aakash tablet. Other two models are T-Pad WS704C (Rs.10999), and T-Pad WS802C (Rs.13500). Let’s see what features are in the low cost tablet T-Pad IS701R. • Resistive 7" Touch screen supported 800x600 resolutions. • Supporting social network connectivity and can be used as an Ebook reader. • 0.3 Mp front camera for skype video calling. • One USB port and Wi-fi support. • Most popular video and audio formats supported. 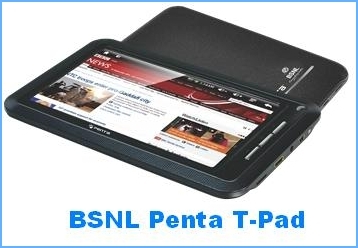 How to Pre Book BSNL Penta T-Pad IS701R Tablet? 1. Go to this official site of Pantel . You will see all three models of Bsnl tablets. Choose any one you liked and click on "View" Button. 2. Then you can see the features of that tablet and Pre-Book Now Button. 3.Enter your name, email, phone and other contact details and submit your details. They will give a booking ID for your purchase transaction. The sales team of Pantel technologies will contact you within 48 hours and tell about your order delivery and payment mode. You can contact their sales enquiry number to more details given in their website.